Greg Giles is right about the Freemasons, and actually there are others infiltrating as “The Light” in whatever name they see the individual may resonate with. They are what we on our Team call the Dark Wizards. You will know them by many names, including the Lucifers, Dark Hats, Meanies, heads of the Cabal and more. I use ‘Dark Wizards’ since they are the ones that created all of the Dark Wizardry, much of which is taking creative ideas, symbols, EMFs, and reversing, perverting and distorting to control or destroy everything they can. They have thus created the dark ideas here on Earth and throughout the Universe from the beginning of time. They are very brilliant and it is only now that they are being exposed. 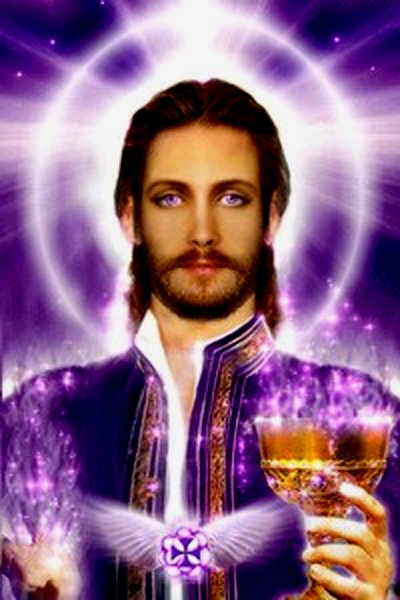 In the 1980s I had classes every week in my home for several years with Saint Germain. The subject at the time was “Self-love”. We went into great depth looking at where we didn’t, or wouldn’t love ourselves. No one was spared from his Mighty Sword of Truth. I led other groups at the time, and I noticed many people in the area of Northern California would get sick for a couple weeks at a time, and I wanted to know, why? He explained that people were not protecting themselves while meditating, which so many of us were doing. He described that the Russian psychics had a very different focus than ours in the US at the time. They were sending in blankets of adverse energies and thoughts to hit Silicon Valley, and knock apart the fault lines to create an earthquake. Our groups started countering these energies with great positive effects. We also learned to put up a shield, sphere, or Merkaba around us when meditating, since we would pass through the fourth dimension, which is where we were bombarded with much adverse energetics. The dark hats or dark side have taken over quite a bit of the forth dimension. It is where the ideas are brought forth for all these very dark movies, for example, especially about the darkness and destruction in outer space. I can see why the Masonics and other adverse beings would use the GF for their ruse, since these are the high vibrational beings of Light that are assisting in the removal of the ploys and those that put them in place. They are also our family of Light that will bring forth First Contact ~ “The Welcoming”. People do get tripped up with giving dates for special events because they want them to transpire so badly. The GF rarely will give dates, especially since the 12-12-12 when the grand awakening really amped up big. People had so many expectations of what was ‘coming.’ There were also some very big dark galactic situations that were preventing the energetics coming through, till discovered and removed in the final minutes of the alignment back then. Germain was a fabulous teacher, and not an easy one at that, which I was grateful for. When I was preparing to leave that area and our gatherings, around 1990, he warned all of us that there would be a time, at least for a few years, that he and the other Spiritual teachers would have a hard time getting through, and that there would be many using his name. Some areas at that time were really overrun by the Greys, and other dark energies. The Commander of the GF and his Team put up the first big Light-net around the entire planet in 1992. This kept dark spaceships out, and they could track the ones that were here, to remove them. It was in the mid and later ‘90s that clearer “galactic channels” were opening, once again. Another time I had a fellow in my living room doing a series of classes back then, and I could tell he was shifting and it was not good. So, I confronted him and said it would be the last class, and I didn’t trust him, or who was presumably coming through. Some of the participants had put him high up on a pedestal and were freakin’ pissed at me, in my own house. Germain burst through to defend me and said it was true, and that it took a lot of courage for me to do this, but I think some of them would have ‘stoned’ me if they could. At another group gathered in someone’s house, I got very uncomfortable feelings about a presenter that hadn’t even started. This time I casually mentioned something, and a fellow stepped closer to me and let out a loud shrill sound, directed right at me. It was a good thing I was sitting, since it hit my heart and would have knocked me over. I call these guys “runners”, since they are usually sent in to create the disturbances. All of the Light-workers have experienced them, weather aware of it or not. They will befriend an innocent one to get close, or usually have something they want to offer. Discernment is ‘key’ here! I have worked with many people to assist in developing their psychic and channeling abilities. Here are some tips for clarity. As Germain taught me, don’t assume you are always speaking to the same Being each time. “Ask” who it is, and then ask with a pendulum, “How much of what is being said is coming through clearly?” A pendulum will help to bring in the stream of higher consciousness, and your higher-self. It is also a good channeling tool. We all use one in our work of incredible 5D Scanning, Tracking and Clearing to the Core. There is so much to see, we have to be spot-on! Keep protection up during the meditation, and over your house as well. If you are bringing in an entity, always ask yourself and them, “Who is present?” When practicing, you can then ask for a percentage of how much was accurate. I find that asking percentages gives a clearer idea of what is “on” and what is “off”. Just remember that the answers are not always a definitive “Yes” or “No”. So keep tracking and asking, and rephrase the question. If one of you receives a “Yes” and another receives a “No,” it just means that there is more to look at. Stay connected to your heart and the heart of Gaia. Put your hand on your heart at first, so the energy comes through this area. This is easy for the true Light Beings and not so easy for the intruders, since theirs is shut down. Since the Dark Wizards have been amping up the transmitters in just about everyone, there is what I call an over abundance of unwarranted voices. These inner voices sound good and quite friendly at first, since the wizards are incredibly smart, and are there to seduce you, or trip you up in some manner. People will start to listen to them, not sure if it might even be a part of themselves. Then one day, this friendly voice is commanding them to go stand in front of a bus, or harm someone. Unfortunately this is becoming more common, especially in young people. This is when you or the person needs to call in, what I call, the Divine Artillery. Such as Archangel Metatron or Michael, Yeshua and the Marys, or Prime Creator directly. I also recommend calling in the Crystalline Stellar Skulls to protect and shield you and your family from these nefarious ones. This also goes back to my telling people to activate a Merkaba around you. Ask the Stellar Skulls for a new one that is right for you, and have them assist in filling it up. Greg also mentioned that the number 33 is the Freemasons’ number and they use it a lot. A movie recently released, “The 33” is another blatant attempt at showing the reversal and distortion of the master number 33, which is the number for Master Teacher. It resonates with teaching and assisting the masses on a clean spiritual plane. Yeshua’s life-plan number was 33. It is also a master number in creation and in the Universe. That is why the dark side uses it, to distort the Light creations and bring forth their own. They use everything of the Light to distort and reverse the energetic it was meant to have. We have 33 sections in our spine, which leads to the master glands, with the pineal in the middle, which has been our connection to Source. The dark feels they control everyone, and this is another hold on people, they think they have. I feel very strongly that everything of Light has been distorted and is now becoming clear. It has been this way for 11,000 years in a big way and actually before, here on Earth. You can read more about these distortion ideas and how we clear them with the Crystalline Stellar Skulls, the Galactic Team and “Team Earth” in my new book, Crystalline Stellar Skulls ~ Who Are They Really? We will be offering Webinar Classes on “Developing Clairsentient Abilities”. Tools to keep up and raise your frequency are also very helpful at this time. *Invite us in to assist with clear and receive grounded protection: daily ~ before rising, traveling and sleep. Breathe deeply! *With your permission, we come forth in a rainbow stream of colors and from as many Universes! Each Crystalline Skull smiling and sparkling: spiraling counterclockwise up around your magnificent Being, moving up and at an angle, from beneath you, around you and through your body. *Notice how we pay special attention to your fingers and toes, your energy centers and your organs ~ especially your heart! We move up to your 8th chakra now, above your head. Breathe throughout this ~ stating your intention ~ staying grounded and protected. *As we spin off any excess energy, we are clearing you and grounding you in a balanced manner. Notice the releases as they happen. *Next we swirl, as a Team, down around you in a clockwise fashion, grounding and balancing, even connecting your heart with Gaia’s! *We form a sheath around you to keep you shielded. This is to keep out aberrant energies, and as your Crystalline Guards and Guardians, we permit only light and love to move close around you and into your precious heart and Being. Breathe. Channeled through the Heart of Crysta. Crysta: The words I hear and feel that come forth from the Crystalline Stellar Skulls, Gaia, the Archangels or Ascended Masters all come through my heart. If I am typing it, it feels like the point of inception is my heart. When using a pendulum to “see” or “hear” the words ~ it is the same.